welcoming it in from up here in Maine was a real treat. The weather has been remarkable. topped off with a Christmas day snowfall. think I could stand such beauty. He's a bit chunky ... sort of like me these days. And I toast to our continued travels together, my friends. those are spectacular photos. I love that lime house! the scenes are fairytale perfect. wishing you all the best in 2012 Reena. i'd miss that chunk o' kitty, too! your images are beautiful! each of them better than the last! can't pick a favorite! Superb captures, Reena! What a beautiful place, but I'd have missed your chunky friend, too! What great looking friend and I know you'll both be glad to see each other! Enjoy! As far as chunkiness, it's a look most of us embrace...sort of like me...POOH! Your photos are great...love your coloring on the last one that is one flashy house lol! Kitty Kramer is a big fella ..and I thought my Mandy was...hmmmm..a bit chunky?? Slimmer is not always better. My grandchildren firmly informed me that they preferred a comfortable grandma, not someone full of poky angles. Main seems like heaven to me. I was under the erroneous impression that you had moved there. Ah well we all must do a reality check now and then . . . Cheers! Thank you for so many inspiring and beautiful photos throughout the year. Gorgeous landscapes topped off with a heartwarming furbaby face. Beautiful photos! Ahhh...kitty is so adorable...I would miss him too. Safe travels. I toast to countless shared travels with you! I have enjoyed your photographs and I hope there will be many more to come in 2012. 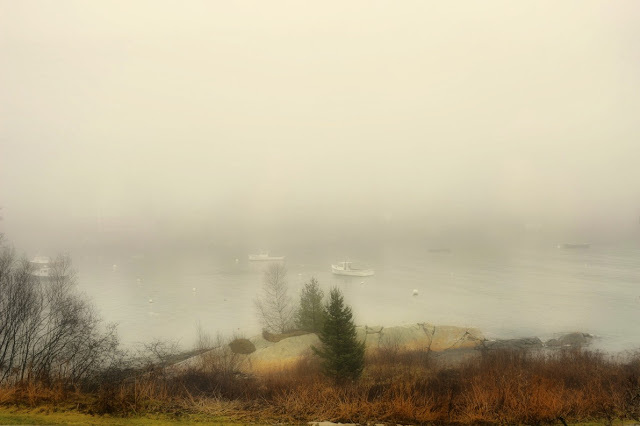 The misty photo is so mysterious - just like our expectations of a new year. The scenes from Maine are absolutely magical! We're still waiting for even just a little bit of snow here. Happy 2012!!! I miss Maine and the scenery there. Happy New Year my friend! Happy New Year Reena! Love the fog shot. What a lovely post and gorgeous pictures! :) Happy New Year! Love your pictures and I am sure kitty misses you too. I can remember when I had a special cat. If I was gone for very long, when I came back .. that cat would actually hug me. 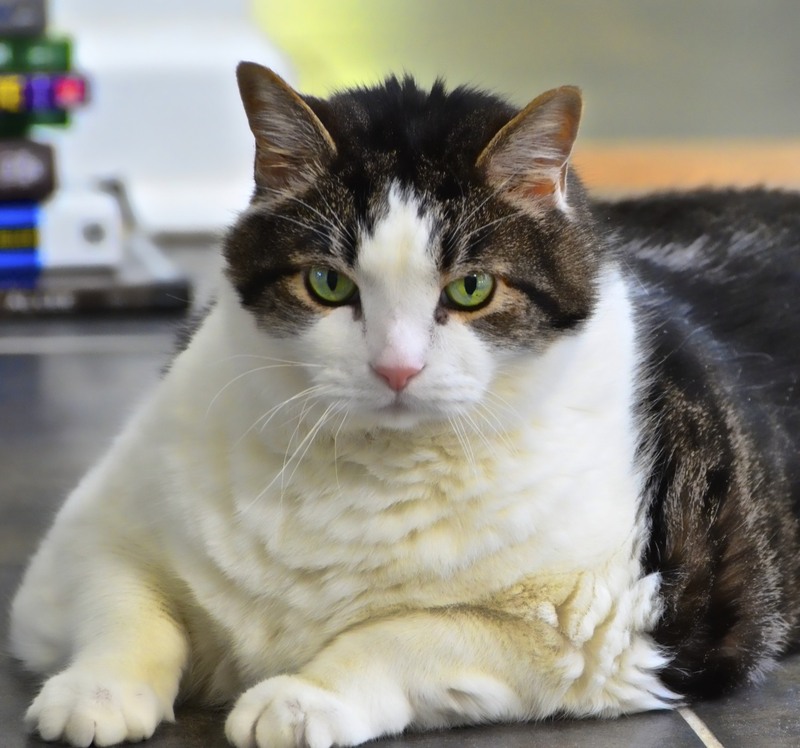 i love a fat cat.....i really do....and this one looks like a keeper alright !! Oh Ms. Reena...you have made this ladycat's heart skip a beat by showing me a picture of the most handsome Kramer...and OMC he has a pink nose and emerald eyes. I think I feel a case of the vapors coming. 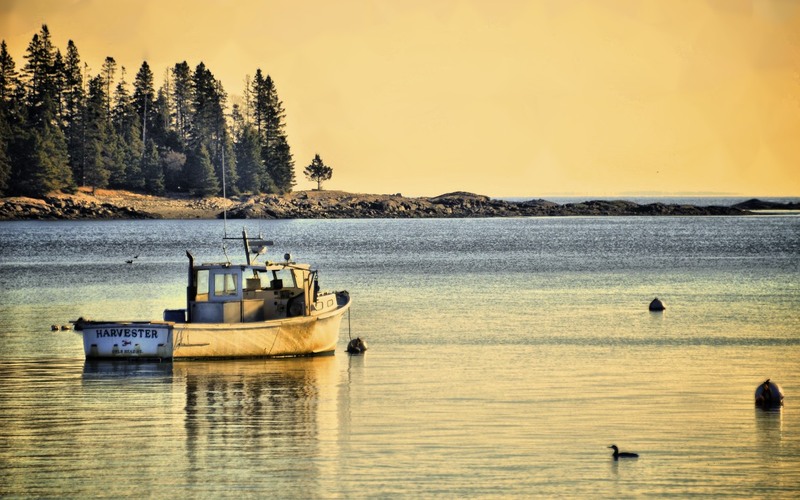 Love Maine! Marvelous pictures. Happy New Year, Reena! Reena, glad you've loved your stay in Maine. Isn't it a pain how reality gets in the way sometimes?? Oh I love Kramer, he is so handsome and he makes our Jack look slim in comparison ... hurry home, I need a Reena fix! Absolutely beautiful shots - love that fog. Wonderful light, wonderful pictures ! I hope 2012 is a great year for you.. Magnificent scenery - picture postcard perfect! I do like 'the look' the kitty is giving! Safe travels. The photos are beautiful. What a lovely shot.. I wouldn't want to leave.. It truly looks heavenly.. Your chubby kitty is to cute. I am looking forward to seeing all your photos in the new year my friend..
Well I for one have been missing your backyard birds. The kitty is delightful! These look like they are made for a card! Lovely. Happy New Year, Reena! I look forward to more travels with you and your camera! wow what a cool series of photos.. i think your kitty is adorable ~ Happy New Year!! gorgeous pictures reena, you have a real eye for the beautiful!! it sounds like you are enjoying the best of everything!! You have such a way - truly - look at that third photo - just incredible. Beautiful photos. The cat looks happy. I love that green house just popping out around that white and reflection! And look at green eyed kitty ~ I bet he will be happy to see you! Looking forward to more of your photos in 2012! oh, that center image is just poetry, it's so peaceful. then i scroll farther down and see the cat, and bust out laughing! his expression says "don't you dare post this with comments about my weight!" oops, sorry kramer. Visiting your blog is somewhat like visiting a gallery, Reena! So glad you had a wonderful break. Happy New Year! Such lovely scenery and photos. But I know you will love the views when you get back too! Hi Reena, lovely post. Your photoS are gorgeous. The snowfall capture is just awesome and would look great framed. Have a wonderful week! Happy New Year!! I have been laid up with the flu for about a week now. Wonderful post. Kitty is just gorgeous. A slimmer you? How about a slimmer me? Maybe we could become diet buddies - ya think? Great post, reena. I missed ya. Cheers!! 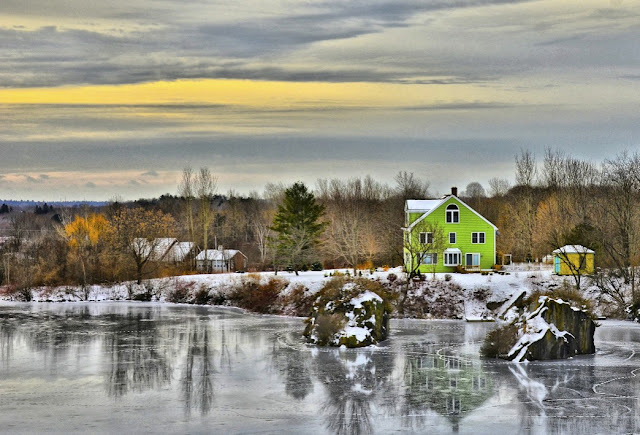 That green house and icy lake is picture/postcard perfect! I'd love to be there! Happy New Year, Rena! Wonderful photos, Reena.. just beautiful. And that kitty is great! Between FL and ME I have been having fun catching up with your posts! Happy Happy New Year! 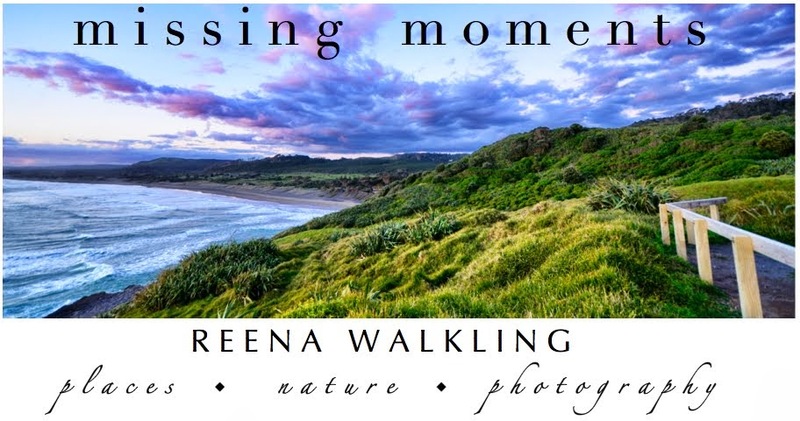 Gorgeous photos Reena! Wonderful captures. Love the kitty. Your third photo....wow....so beautiful!!! Are you going to frame this one? All of them are very nice, but the one with the reflection off the frozen water is AMAZING! what exquisite shots! the second one is my favourite, but all of these are beautiful!